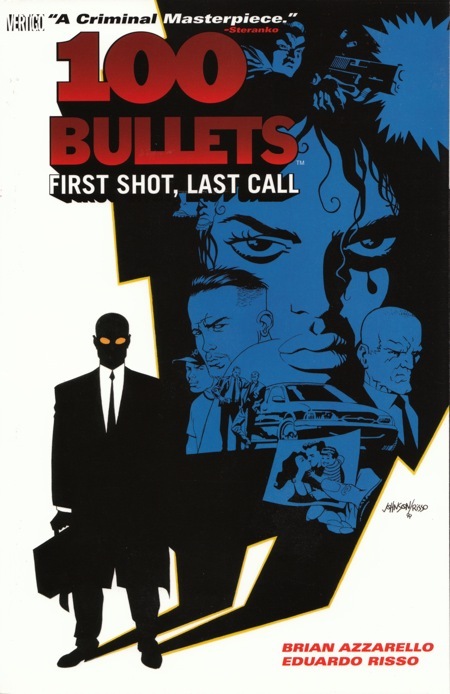 I hadn’t read any 100 Bullets before this, and wasn’t even familiar with the premise before I picked it up from the library. Let me begin by saying that I’m not a huge fan of the “noir” genre, and this is definitely heralded as a “crime thriller”, something that holds little appeal to me. 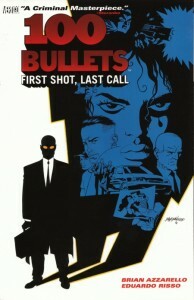 I had heard this was great though, and it’s won some eisner awards, so I thought I’d give it a shot. The premise is thus: A shady (but so far benevolent) cop (or something more?) gives people who have been wronged a briefcase with a gun and 100 “untraceable” bullets to right their injustice. The first story of the series (I have no idea if these characters recur), is about Isabelle “Dizzy” Cordova, a former teenage gangbanger, whose husband and child were killed in a drive by. Until this shadowy guy gives her the hundred bullets, she’d thought it was by a rival gang that did it, but he also puts “proof” in the briefcase about how it was two crooked cops who did it. This brings me to the over-arching disbelief suspension for me about this. The recipients of the 100 bullets can’t show this proof to anyone or the whole deal is off. (What about… maybe… showing it to the cops?) In the first story, this makes a bit of sense, because the killers / bad guys were also cops, so you show this “proof” to the wrong people and you’d probably just end up dead. But we never actually see the proof, so there’s really no way for us to judge whether it would have been compelling to someone outside the system– say a federal court, or a judge. We do get glimpses of our shady 100 bullets guy in the police station, which seems to imply that this is a localized phenomenon, but at this point, he could be anyone or anything. The second story in this trade is shorter, and less compelling than the first. I’ll probably pick up the next couple of trade paperbacks, because I’d like to read the eisner award winning series in issues 15-18, but whether I continue reading after that depends a lot on how much of the over-arching story I’m getting/enjoying. It does seem that this has an actual conclusion, after nine TPBs, but at this point I’m not sure whether I’m ready for that long of a commitment. This entry was posted by Martin	on Saturday, June 7th, 2008 at 10:00 am and is filed under TPBs/graphic novels, Vertigo. You can follow any responses to this entry through the RSS 2.0 feed. You can leave a response, or trackback from your own site. I’ve only read through the first three, but liked them quite a bit. If you do read past that, lemme know how it is!